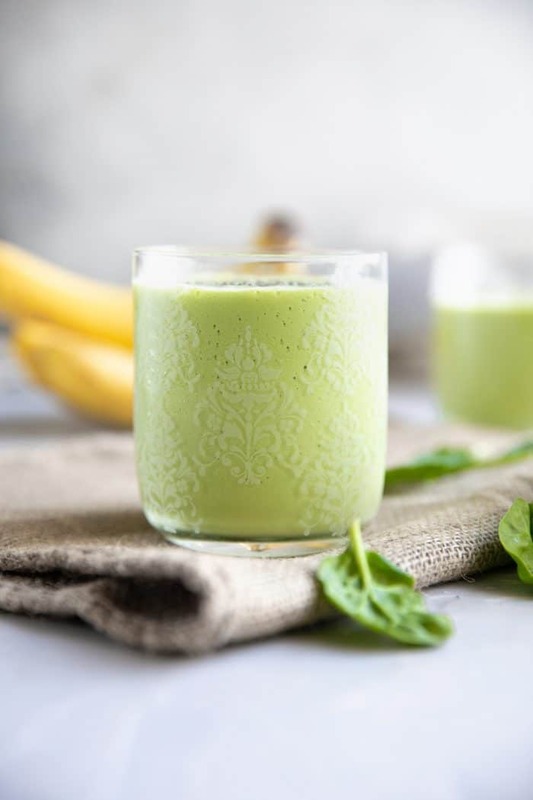 The absolute very best Green Smoothie EVER, everyone, including teeny tiny kiddos, will love this fruit and veggie packed mango, peach, and spinach Green Smoothie Recipe. Smoothies are basically the best food ever invented. Endless varieties and mixtures, smoothies are my breakfast bff and never get old. 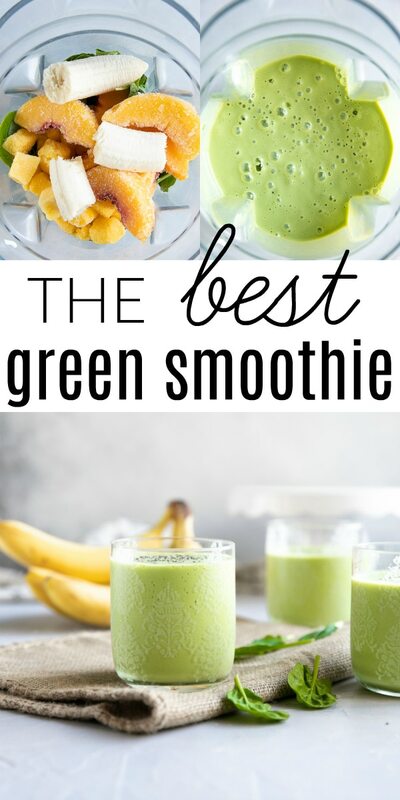 My personal favorite is a green smoothie (or, as my 5-year-old says, “the green one”). Made with milk, yogurt, spinach, frozen peaches, frozen mango, and banana. 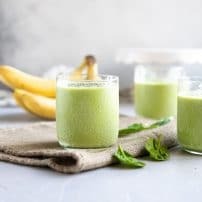 Aside from being completely delicious, this family-favorite green smoothie is the only way my child will eat spinach– and not just eat it, but beg me for more! Freeze leftovers (if you have any) into popsicles or into ice cubes and pop them into your next smoothie concoction. Yogurt – I love adding yogurt to smoothies as it helps make them dreamy, creamy, and filling. In this particular smoothie recipe, I added full-fat vanilla yogurt instead of any added sugar or sweetener. That said, feel free to add plain yogurt or another preferred flavored yogurt if you prefer. Milk – I’m a big fan of adding milk to just about any smoothie I make. Whether its regular cow milk, soy, almond, coconut, or any other, milk is the best liquid choice for smoothies. 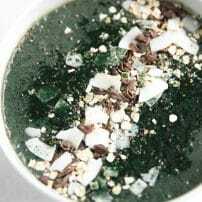 Spinach – If you’re new to green smoothies, I recommend starting with spinach before moving on to something like kale which typically has a grassier taste (though still delicious). Don’t worry, with all these other ingredients, you’ll hardly even know it’s there! Peach + Mango – My (personal) favorite fruit combination for all green smoothies. With just the right amount of sweetness, you can really pack in the greens. Banana – While banana isn’t exactly a must have, I love adding one just for its extra creaminess. Plus, they taste pretty good too (and they’re loaded with potassium which is super healthy). 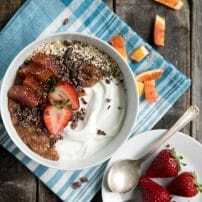 Chia Seeds – Rich in omega 3’s, antioxidants, fiber, iron, and calcium, chia seeds and super healthy tiny little seeds that virtually taste like nothing. 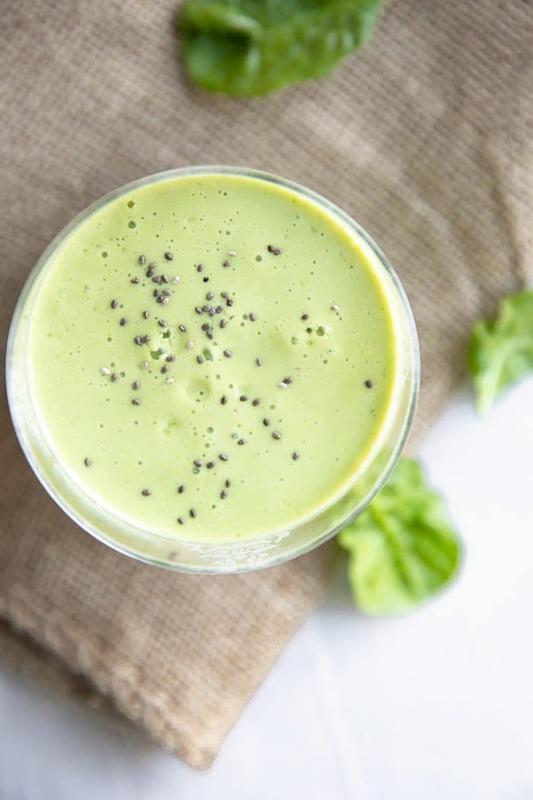 Smoothies are one of the easiest and most delicious ways to pack a ton of nutrients into a simple, delicious, 5-minute drink that can be transported just about anywhere. For best results, I recommend that you use a high-speed blender. This is the one I own and love. Add all ingredients to the bowl of a large blender. Start with the liquids- yogurt and milk first, followed by the spinach, frozen fruit, banana, and chia seeds. Process until frozen mango and peaches are fully blended and the spinach is completely processed. And more milk or yogurt as needed. The best part about green smoothies (aside from tasting so awesome!) is that you can mold them to be exactly what you want. 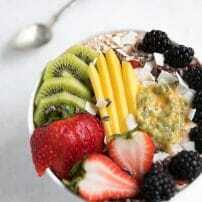 Rolled Oats – Add a few tablespoons of rolled oats for even more healthy fiber. Do you have any leftover cooked quinoa? Add a couple of scoops and blend, blend, blend. Nut Butters – Almond butter is especially delicious with spinach, but feel free to add your favorite! Already a green smoothie lover?? 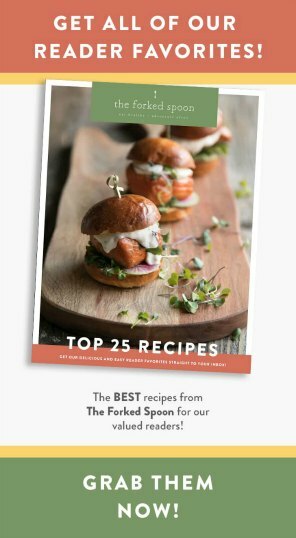 Try one with kale. Try different fruit combinations. Mixed berries (strawberry is so good! ), pineapple, kiwi, etc. Or try a different liquid – perhaps some freshly squeezed orange juice or apple juice. Add some ginger. 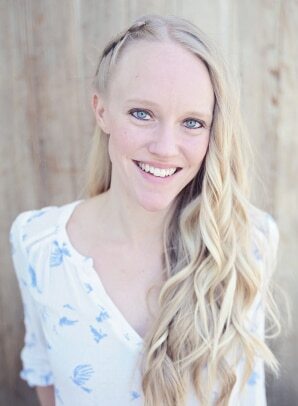 Ginger is incredibly healthy. Add a teaspoon of fresh ginger when you’re feeling crummy and you’ll be back to good in no time. So we know about the ingredients and some fun variations, but are green smoothies actually healthy? The answer to this is somewhat more complex than a simple yes or no. Should you add loads of sugary yogurt, fruit juice, and tablespoons (plural) of nut butter, and some of the healthiness may be lost. But, keep an eye on the sugars and the “extras” and green smoothies are a magical way to give your body all the fuel it needs. Green smoothies naturally fuel your body thanks to all the vitamins, minerals, antioxidants, and other nutrients. Strengthens your immune system. Fruits and vegetables are natural immune boosters. Oranges and ginger provide an especially powerful immune-boosting punch. Keeps your bones strong. 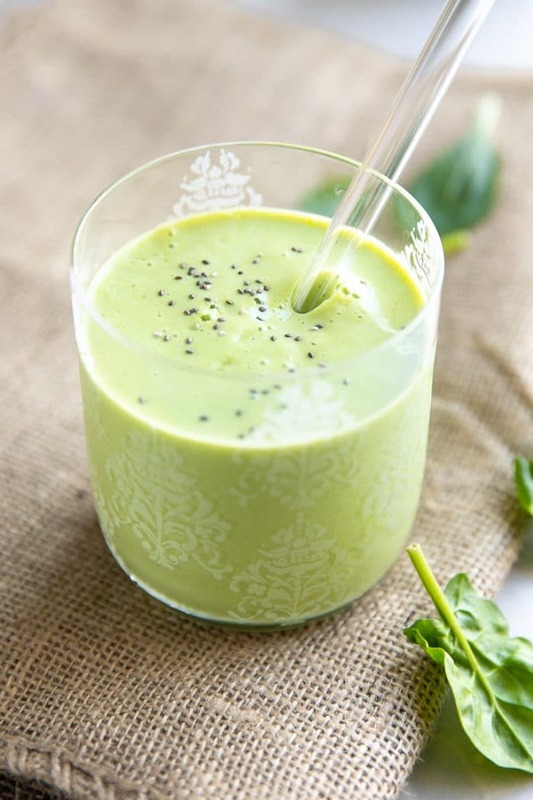 Thanks to all the dark, leafy greens, green smoothies are rich in minerals such as calcium, magnesium, and phosphorus. Disease-fighting antioxidants. Thanks to the phytonutrients in leafy greens, your body’s immune system gets a little boost and keeps functioning properly. Always add the liquid and “soft” ingredients to the blender first. Fortunately, my blender allows me to add everything at the same time (still starting with the liquid first), but I don’t have to blend in stages. That said, should you have a less powerful blender, I recommend blending the yogurt, milk, and spinach first, followed by the frozen fruit, adding additional liquid as needed. Before adding loads of added sugars (like honey, agave, or granulated sugar), try your smoothie first – especially if you added vanilla yogurt. Vanilla yogurt already comes loaded with lots of sugar, so between that and the fruit, it should be on the sweeter side. Frozen fruit is better than ice. Do you love super thick, super cold smoothies? 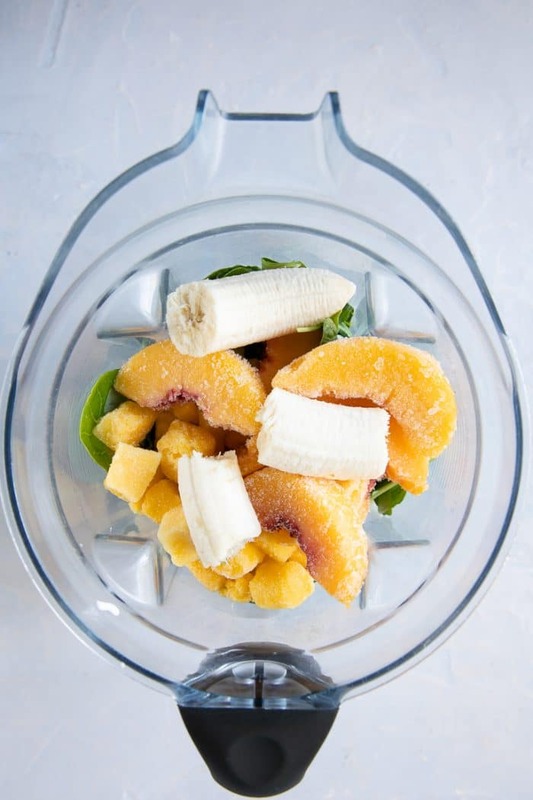 Add frozen fruit (especially bananas) instead of ice. 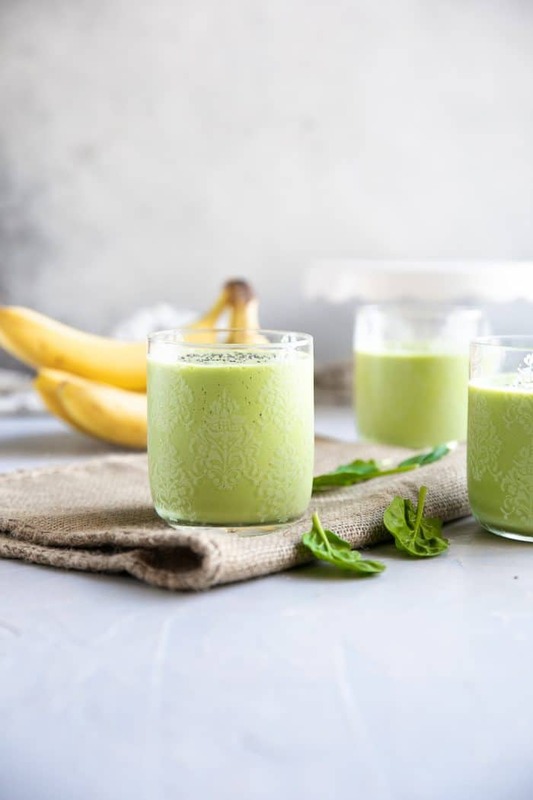 There is one exception- if you know you will be enjoying your smoothie right away, a little ice is OK and won’t risk watering down your smoothie. If this is the first time you’ve ever made a smoothie, measure your ingredients– at least roughly. The last thing you need is a smoothie without enough liquid that it’s impossible to blend. Fresh spinach is best. Now, I have nothing against frozen spinach however when we’re talking smoothies, fresh tastes best. Somehow you can taste the difference. Keep leftovers stored in the refrigerator for up to two days (note- there will be some natural separation, simply shake well before drinking). 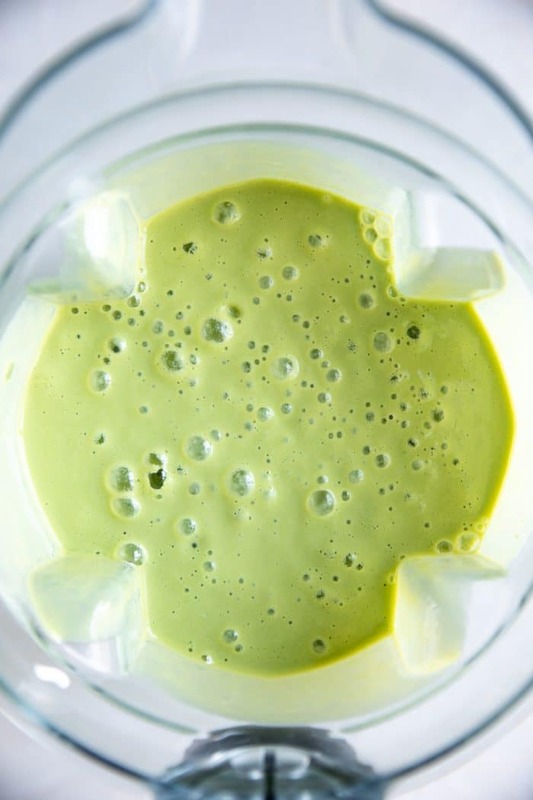 If you try making this Green Smoothie, please leave me a comment and let me know! I always love to hear your thoughts. DON’T FORGET TO PIN AND SHARE THIS GREEN SMOOTHIE RECIPE AND ADD IT TO YOUR NEXT WEEKLY MEAL PLAN! 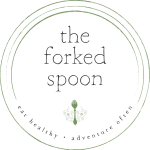 Add all ingredients to the bowl of a large blender, starting with the liquids (yogurt and milk) and ending with the frozen ingredients (frozen fruit).